Does anyone remember “buddy burgers” from Burger King? I think that this retired menu item from the fast-food chain must have appeared sometime in the mid-to-late 1980s. As little kids, my brother and I enjoyed the novelty: two little hamburgers attached by virtue of a conjoined bun. I didn’t really have a taste for hamburgers then, but we liked pulling them apart and each getting a burger (for what that was worth). Here I’ve revamped the memory by making two types of sandwiches: one with a cornmeal-crusted flounder fillet, and one with a small beef patty — on two adjacent potato rolls. I’m planning on making this for Valentine’s Day. This meal takes a different approach to the Valentine’s Day theme than my previous ones, which were catered to a specific person (or, plain angst for lack of one). It’s more symbolic of a relationship, or union, with its dual characteristics and ultimate bond: these burgers are meant to be eaten together, as one meal. For me, it represents the best of both worlds, too: light, summery beach eating, and pub grub to tuck into by a roaring fire. I’ve enjoyed both experiences — and types of sandwiches — over the course of my relationship with my boyfriend, Shane. From fish shacks in Montauk during its sleepy, pre-summer days, to snowy winters in Brooklyn, Milwaukee and Vermont. You can’t escape these quintessential sandwiches, in this country at least. And you can always make great versions of them at home easily. For the fried fish sandwich, I followed the lessons I’d learned over perfecting my favorite, quick and simple style here. After picking out fresh flounder fillets from Blue Moon Fish, I patted them with some seasoning and turned them over on a plate of cornmeal a few times. A shallow layer of hot oil, a flip and a few minutes on each side, and it’s done. A garnish more akin to that of fish tacos, this was topped with a generous pile of shredded celery, cabbage and carrot, bound in a slaw-like mixture with a dollop of yogurt (sub in mayo or sour cream if you will). 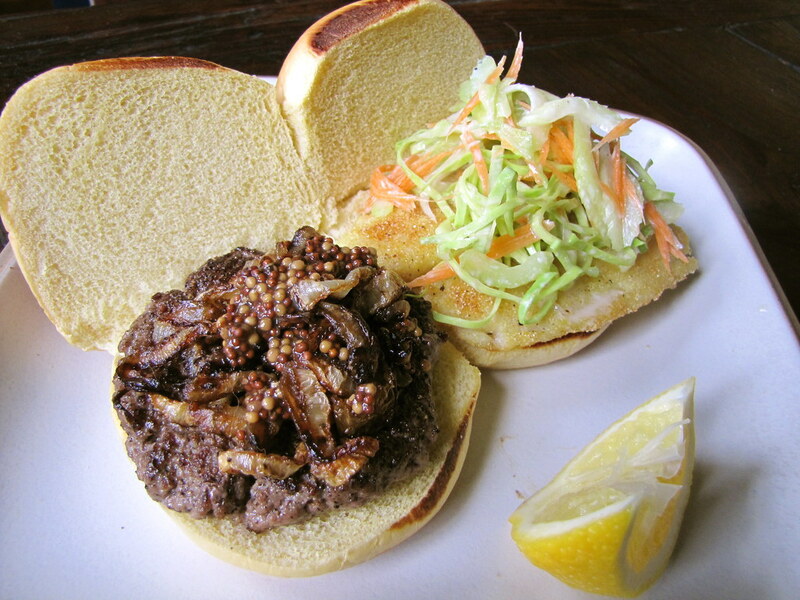 A good beef patty needs little embellishment, in my opinion, and since the fish sandwich had a lot of freshness and crunch I sliced some onion to caramelize slowly on a cast-iron pan. Once translucent and a little bit crispy and burnt, the caramel rings were mixed with a spoonful of whole-grain mustard to make the sole topping for the well-seasoned, medium-rare cooked patty. 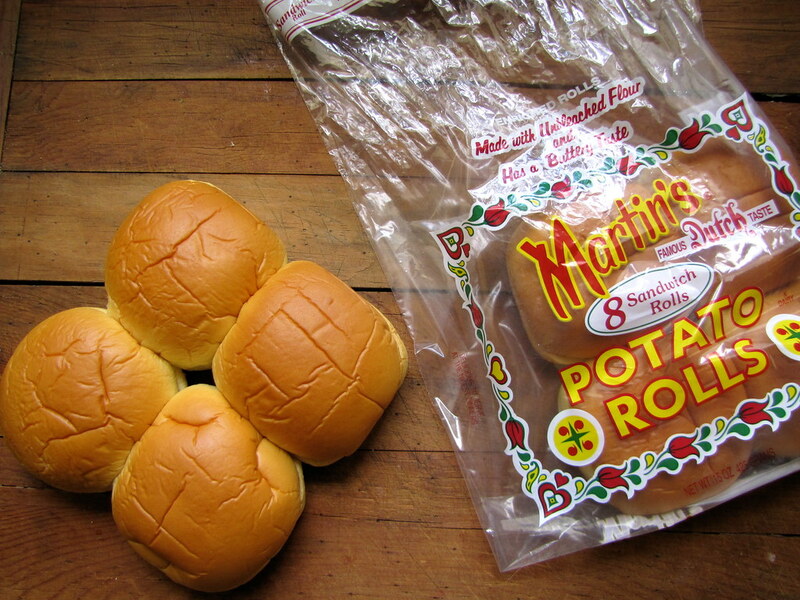 Any pack of mediocre hamburger buns will have been baked together in quadruplets, which must be pulled apart. Come again, you could celebrate a family of four with one whole sheet of these. Or just break them off into convenient twos for “buddies.” I tried to brown my pair a little on the tops and bottoms, as it wasn’t really going to happen on the interiors with them still being attached. If you prefer more sophisticated buns than this, you can always bake them too close together that they merge in a similar manner; as for me, I enjoy the soft, fluffiness of potato rolls as a guilty pleasure. There are so many dualities you could go on about for this dish, with the cooling freshness of the fish sandwich and the spicy, oniony toppings on the greasy burger: yin and yang, sea and land, feminine and masculine, summer and winter. The question of which one is me and which one is my partner is irrelevant, I think, because we’re all either at some point — and we all crave either, or both, sometimes. Do opposites attract? At least here, they’re attached. 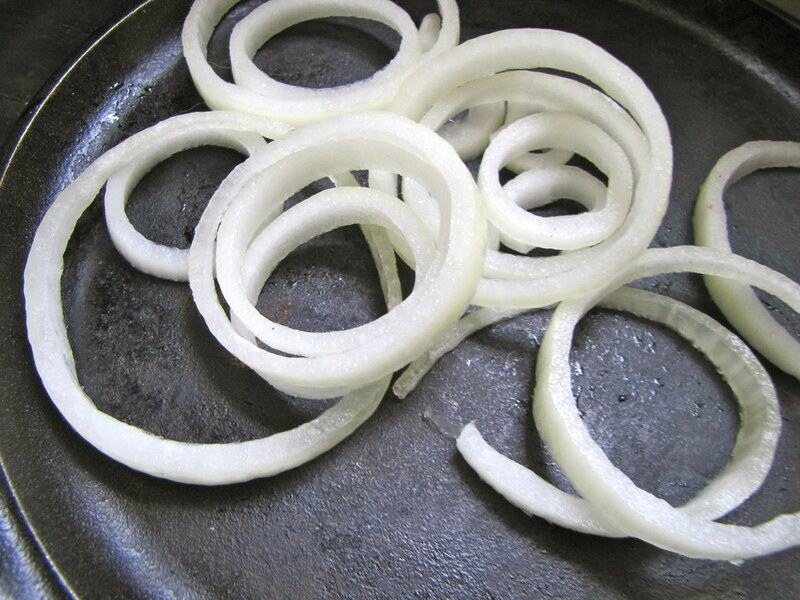 Heat a heavy-bottomed saucepan with 2 Tb oil and add the sliced onion. Once it begins to sizzle, reduce heat to medium-low and let cook, turning occasionally, for 20-30 minutes, or until translucent and caramel-brown in color. Transfer onions to a small bowl and mix with the mustard. 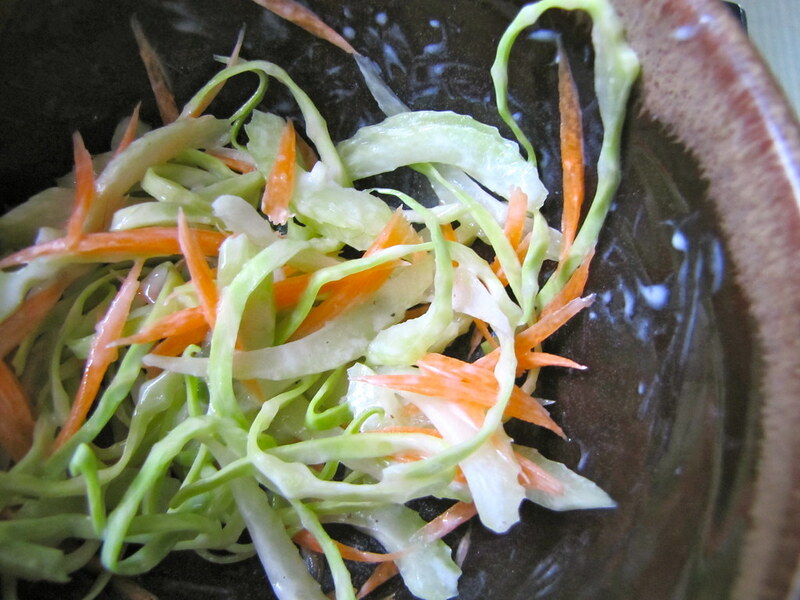 Meanwhile, toss the shredded celery, cabbage and carrots with the yogurt and season with salt and pepper to taste. Pour cornmeal on a flat plate. Season the fish fillets on both sides with salt and pepper, then coat in a thin layer of the cornmeal. 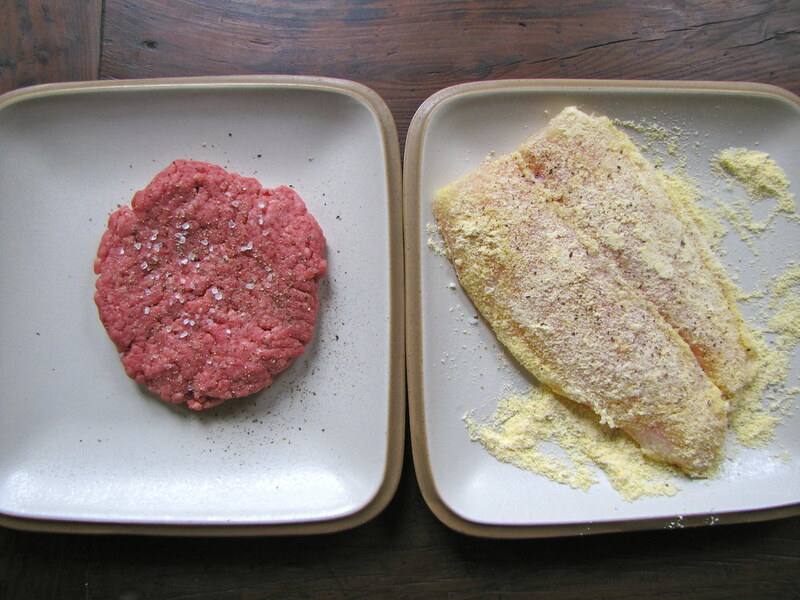 Divide the ground beef into two patties and season both sides with salt and pepper. In a large, wide saucepan, heat 3-4 Tb of the oil over a high flame. Once very hot, add the fish fillets and don’t flip until bottom is lightly browned, 1-2 minutes. Flip, and cook the opposite side until lightly browned. Fish should be just opaque throughout and firmer to the feel when cooked through, about 4 minutes total depending on the thickness of the fillets. Wipe saucepan clean of cornmeal and heat over a high flame again. Add the beef patties and let brown on the bottoms another 1-2 minutes or so. Flip and cook to desired doneness. Lightly toast the tops and bottoms of the pairs of buns. 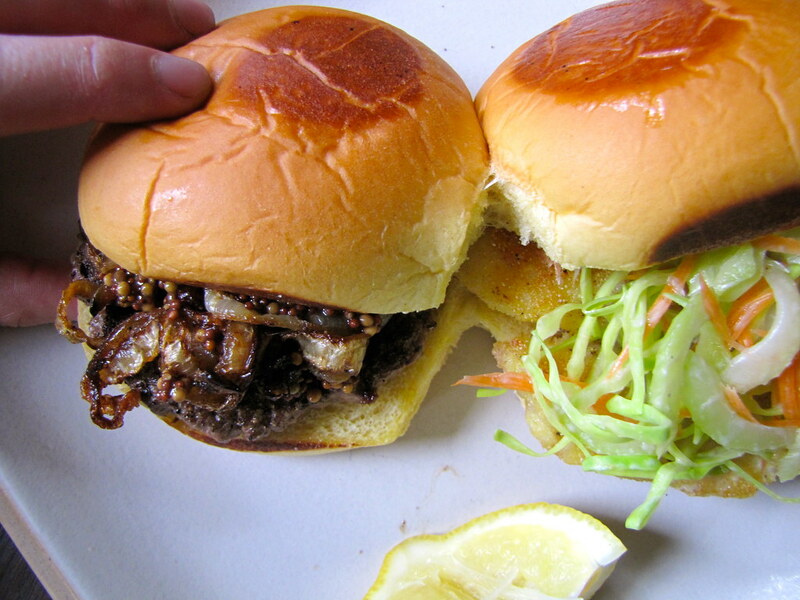 Fill each duo with one fish fillet topped with the slaw, and one hamburger topped with the caramelized onion mixture, and serve immediately. Seven brownie points: It’s okay to indulge a little on Valentine’s Day. This recipe keeps it simple with only a few mostly fresh and totally natural toppings for the otherwise greasy meal. But by pan-frying the fish in a small amount of oil, and coating it with cornmeal, you achieve the crispiness you crave from a deep-fried version, which would be much more so. The burger doesn’t have a whole menu of processed condiments, and I’ve recently made mustard from whole seeds (and beer). No brownie points however for the refined flour buns, which are famous for making your energy crash and burn. 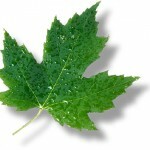 Seven maple leaves: Without the store-bought buns, this is actually a generously local and seasonal meal. For freshness’ sake, it doesn’t make much sense not to buy local and just-caught, like you can right at the Greenmarket. Also there is some of the tastiest meat to be found, and making a burger is a great way to showcase this flavor. Find the onion, cabbage, carrot and celery locally as well any season of the year, and very inexpensively at that. hi! i just finished your book that i picked up on a whim. 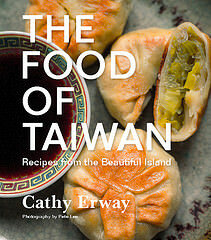 i enjoyed it immensely and am inspired to eat in and eat better this year. thank you! That burger looks soooo delicious. I never thought of making a burger with fish. I am seven weeks pregnant and have been craving fish and sweets so I think the surf and turf burger with carrot recipe is great. My doctor told me to maintain a balanced diet and this burger offers everything I crave so I am truly grateful for your recipe. Thanks!